Cleistothecium of Microsphaera vanbruntiana, copyright W. N. Ellis. The Erysiphaceae are a group of fungi including the powdery mildews. 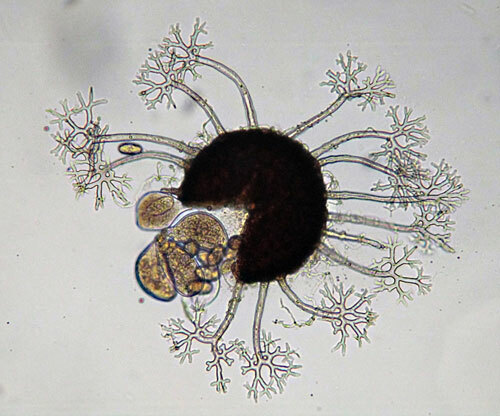 Members of this family have a white mycelium producing large, non-septate conidia on simple, erect conidiophores, and indehiscent perithecia containing non-septate ascospores. [D03] David, J. C. 2003. Orthographic conundrums: The problem of –opsis and –botrys. Taxon 52: 603–608. [EB03] Eriksson, O. E., H. O. Barah, R. S. Currah, K. Hansen, C. P. Kurtzman, G. Rambold & T. Laessøe (eds.) 2003. Outline of Ascomycota – 2003. Myconet 9: 1–89. [GAK07] Guichou, S., P. Auger & S. Kreiter. 2007. The acaricidal effect of sulfur on Tetranychus urticae (Acari: Tetranychidae) under laboratory conditions. In: Morales-Malacara, J. B., V. M. Behan-Pelletier, E. Ueckermann, T. M. Pérez, E. G. Estrada-Venegas & M. Badii (eds) Acarology XI: Proceedings of the International Congress pp. 535–545. Instituto de Biología and Faculdad de Ciencias, Universidad Nacional Autónoma de México, Sociedad Latinoamericana de Acarología: México. [H86] Haviland, E. 1886. On a microscopic fungus parasitic upon the Cucurbitaceae. Proceedings of the Linnean Society of New South Wales, series 2, 1 (1): 173–175. [M26] Murray, B. J. 1926. Four fungi on the endemic species of Rubus in New Zealand. Transactions and Proceedings of the New Zealand Institute 57: 218–225. [ST99] Saenz, G. S., & J. W. Taylor. 1999. Phylogenetic relationships of Meliola and Meliolina inferred from nuclear small subunit rRNA sequences. Mycological Research 103 (8): 1049–1056. [SS09] Schoch, C. L., G.-H. Sung, F. López-Giráldez, J. P. Townsend, J. Miadlikowska, V. Hofstetter, B. Robbertse, P. B. Matheny, F. Kauff, Z. Wang, C. Gueidan, R. M. Andrie, K. Trippe, L. M. Ciufetti, A. Wynns, E. Fraker, B. P. Hodkinson, G. Bonito, J. Z. Groenewald, M. Arzanlou, G. S. de Hoog, P. W. Crous, D. Hewitt, D. H. Pfister, K. Peterson, M. Gryzenhout, M. J. Wingfield, A. Aptroot, S.-O. Suh, M. Blackwell, D. M. Hillis, G. W. Griffith, L. A. Castlebury, A. Y. Rossman, H. T. Lumbsch, R. Lücking, B. Büdel, A. Rauhut, P. Diederich, D. Ertz, D. M. Geiser, K. Hosaka, P. Inderbitzin, J. Kohlmeyer, B. Volkmann-Kohlmeyer, L. Mostert, K. O'Donnell, H. Sipman, J. D. Rogers, R. A. Shoemaker, J. Sugiyama, R. C. Summerbell, W. Untereiner, P. R. Johnston, S. Stenroos, A. Zuccaro, P. S. Dyer, P. D. Crittenden, M. S. Cole, K. Hansen, J. M. Trappe, R. Yahr, F. Lutzoni & J. W. Spatafora. 2009. The Ascomycota tree of life: a phylum-wide phylogeny clarifies the origin and evolution of fundamental reproductive and ecological traits. Systematic Biology 58 (2): 224–239. [SL02] Schweigkofler, W., K. Lopandic, O. Molnár & H. Prillinger. 2002. Analysis of phylogenetic relationships among Ascomycota with yeast phases using ribosomal DNA sequences and cell wall sugars. Organisms Diversity & Evolution 2: 1–17.